Home » What is Port 2525? Port 2525 is used for secure submission of emails for delivery by modern ESPs. Unlike other SMTP ports, you will not find the port block issue with port 2525. As this is a non-standard port for SMTP, so it is not getting monitored extensively and are allowed on consumer IPs and Cloud hosting providers like Google Compute Engine. It is not an official SMTP port and it is not sanctioned by the IETF nor IANA. It is an alternate port which has the same functions as port 587. 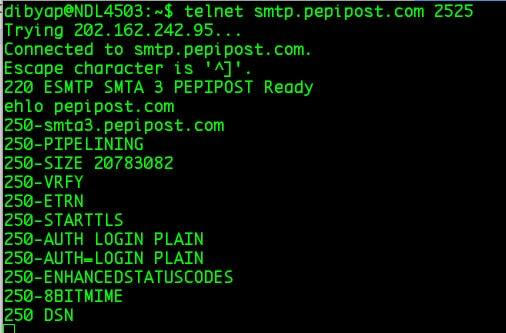 Pepipost supports TLS on port 2525, this you can verify by connecting to smtp.pepipost.com and issuing an “ehlo” command. 250 STARTTLS in output confirms that the endpoint accepts TLS connection requests. How to check if Port 2525 is blocked on your network? There can be more… this is just a sample list. All these are errors from different programming environment, but all lead to a common problem that your outgoing port 465 might be blocked. There are multiple ways to check if a particular port is blocked on your network, the simpliest one to check this is using the telnet command on your terminal as shown in the above screenshot. If Port 2525 is blocked, you will get a connection error or no response at all. There is one more tool outPorts on Github, which is very user-friendly when it comes to checking the outbound ports. But, yes it has multiple dependencies which need to be installed to start using. Most ESPs support the use of Port 2525 as an alternative to port 587 for SMTP. Port 2525 also support TLS encryption. Port 2525 is it as an alternate port, which mirrors port 587, in the case the other mentioned ports are blocked. Port 25 is the default port used for replaying. Port 467 is the port chosen for encrypted connections. Port 587 is used for the secure submission of email for delivery by modern email servers. This port also supports TLS encryption. Port 25 is blocked due to the risk of spam and malware Port 465 should no longer be used at all. Port 587 coupled with TLS encryption is the best way to ensure that any email is submitted securely and reliably. This port is not endorsed by the IETF nor IANA IANA still recognizes Port 25 as the standard, default SMTP port. The port is no longer recognized by IANA. This port has secure according to the guidelines set out by the IETF.